It will forever be an iconic moment in Christian Brothers Academy Soccer lore. With just 19 seconds remaining on the clock in the second overtime, senior Luke Pascarella lined up for a free kick. After nearly 100 minutes of play, the state championship against Delbarton was tied at one with penalty kicks looming to determine a champion. 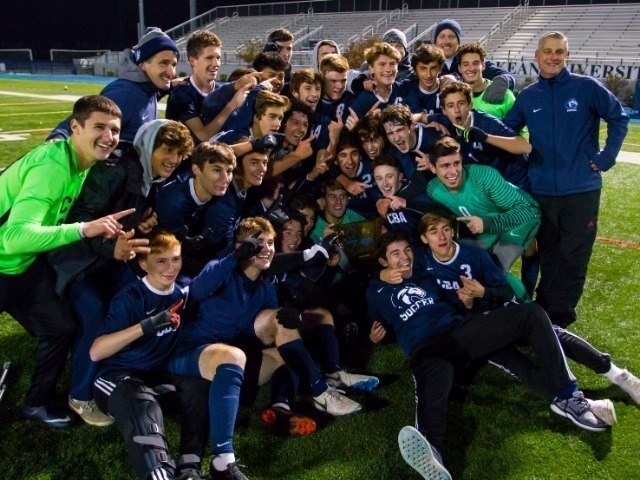 But the dramatic title game ended there, as Pascarella delivered a score past the outstretched arms of the Delbarton goalie to win the seventh state championship in CBA Soccer history. "Luke just has an ability to score in big moments of a game," head coach Tom Mulligan said. "He may not be our fastest or most athletic player, but he has come up with some clutch goals against some of the best teams in the state. He knows when the time is right to step up and make a big play." In a battle between the number one teams in the north and south brackets at Kean University, Delbarton jumped out the a quick 1-0 lead in the first half. The Colts' defense tightened up from there, holding the Green Wave scoreless for the next 95 minutes of play. But before Pascarella could win it, senior Jack Hempstead played hero first, connecting with the back of the net to tie the game with just five minutes remaining in regulation. "We talked about staying focused on our style of play no matter how much time remained or what the score was," Mulligan said. "When you have a group of experienced seniors that have been in several championship games, it helps remind all the players of the urgency to stay in the moment." And the urgency of the moment didn't phase Pascarella, who dashed with his teammates to the Colt Crazies section to celebrate a state title. "We were the underdogs last year, we were the underdogs this year," Pascarella said after the game to a group of reporters crowding him. "We just needed to have the heart, and we all do." It's the seventh title in program history and second in three years. CBA defeated Seton Hall Prep in the 2016 championship, which was Mulligan's first year as head coach. The 2016 team was expected to win the state title and finished as the consensus number one team in New Jersey. This 2018 team lost four games, including the Shore Conference Championship in stunning fashion. However, the Colts' confidence never wavered, and they'll be remembered as thrilling state champions. "This group stuck together all season and believed in each other right down to the final seconds of the season," Mulligan said. "There were times when they could have surrendered and lost hope, but that's not the CBA way. These young men continued put in the work, push each other in practice, and support each other through the difficult times. Their relentless attitude continued through the final moments of the season, and they're state champions because of it."